Day 4 of Scot Food Fort brings us to the humble packed lunch. 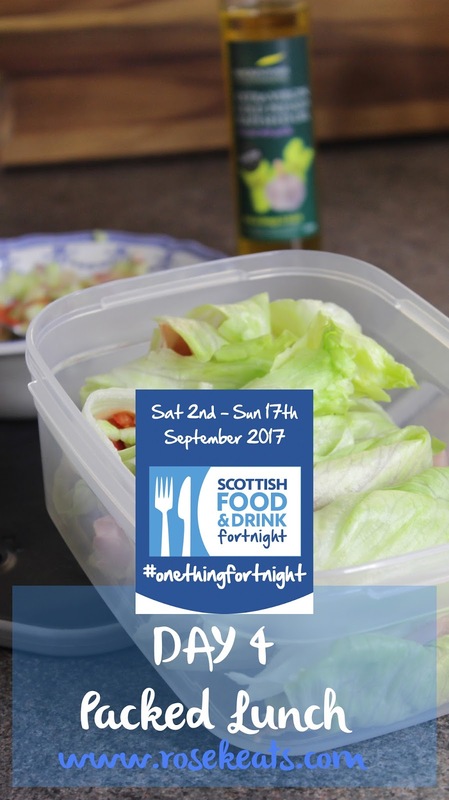 There are easy ways to make a packed lunch a meal that supports the Scottish food industry - for example use Scotch Beef, cheese or salmon on your sandwich. I decided to use some local produce, which I purchased from Dowhill Farm when they had a pop up in Silverburn, along with some excellent Mackintosh of Glendaveny garlic infused rapeseed oil to create a healthy lunch of lettuce wraps. A low carb alternative to traditional bread wraps, but thanks to the rapeseed oil I used, not a tasteless 'wish I was having a proper stodgy carb loaded lunch' alternative. I decided to use it as a dressing and started by chopping up tomatoes, radish and cucumber into cubes then placing the tomatoes in a bowl and pouring 1 tsp of the Mackintosh Garlic infused rapeseed oil in, to really let the tomatoes absorb it. Whilst that was happening I tore the 'wraps' ie the lettuce leaves from my lettuce and laid them out, before adding the radish and cucumber into the bowl with the tomatoes and oil and mixing through. The trick to the wraps is getting the biggest leaves you can from your lettuce and tearing them as minimally as possible - it's a bit tricky but you'll get the hang of it! I laid my lettuce leaves out and placed a piece of ham down on top of it, before spooning my veg and rapeseed oil filling on top of the ham. You then need to pull the lettuce leaf round as tightly as possible and voila - there you have it! A super healthy, delicious lunch full of nutrients that won't leave you feeling like you've missed out. I've created this as part of my Scot Food Fortnight content, don't forget you can join in with Scot Food Fort by using the hashtags #ScotFoodFort and #OneThingFortnight on social media.